I meet and talk with artists every day who have tried to create a presence and a following with social media. After some time, they did not get the results that they thought that they would receive and then they become discouraged. As with most things in life, it takes a consistent effort in order to achieve any meaningful results. Overall, to me the main reasons why artists fail with social media is that they are not providing a value to their connections with any helpful, interesting and relevant content in their comments and posts. There is a reason why it is called “social” media and as artist participants we need to be active, engaged and consistently provide some kind of value, with associated information which is related to our followers’ art interests. If this accomplished consistently well with the artist’s followers, they then will not only keep their present followers, but will also eventually attract more high quality followers. (In this article the reader may substitute the term “follower(s)” with circles, connections, friends, followers and networks). 1. As a potential follower I will want to know who you are, but your profile is not filled out completely or your profile information is blocked. If I have to guess or search to find out what these potential followers do or if they are related to my interests, I simply will not make that effort to “discover” who these people are, as I am too busy and do not have the time to do this. In this type of situation, I will also subliminally say to myself that “this individual cannot be that important or interesting” or “what are they hiding?” Therefore, why should I bother with them? It is like getting a poorly written resume from someone with time gaps between jobs! Sell yourself to me with a complete profile, that is accessible for me to review and that allows me to decide to follow you or not. 2. As a follower if you are posting and tweeting about subjects that are unrelated to our mutual interests, then eventually you will be dropped as your disparate content is cluttering up my stream or wall. I only want to see helpful, interesting and related content from my followers. 3. As a follower you may be in my group or network and have access to my profile but you are not following me, so why should I follow you? Twitter made this clear as to the amount of followers one could accumulate, based on the amount of followers one had. Therefore, if you are not following me, why should I follow you? Your interactions and posts (both generated and received) should be about “our” art business and the information should be mutually beneficial and shared between us. 4. As a follower if you are negative, combative and rude in your interactions and posts you will be dropped quickly as one of my followers. The reasons being are as follow; 1. There is enough negativity dispensed through the media, I do not need more. 2. Why would I want to be “friends” with you, either online or off, if this is the way you conduct yourself? 3. Your negativity and rudeness does nothing to contribute to my being, business or my day. I do not need to be associated with you! 5. As a follower my comments, emails, posts and tweets are not being acknowledged by you. As a follower, you act as if I am not here or that I am unimportant to you. I try to make an effort to recognize your contributions, therefore, why shouldn’t you with mine? Remember, “Turnabout is fair play”. Why should I deal with someone who will not reciprocate with me? If this is the case, you are done as a connection and no longer a follower in my network. 6. As a follower you really are a Spammer in disguise. All you try to do in your posts is try to sell or advertise what you want me to buy from you. How will this enrich, improve or enhance my business and personal life? If I were to go to a networking event or a cocktail party, had just met you and you began right away to sell me your product or service, I would be offended, turned off by you and I think of you as very rude individual! The same holds true online as well. I need to get to know you, how you think and how you act before I would ever consider buying from you. Who are you? One other thing, as a follower I would hope that that you would want to get to know me and my business before you tried to sell me. All great salesmen try to discover as much as possible about the person or their business before they try to sell them anything and as a follower and a connection you should too. A great salesmen is there to help the client solve a problem and to improve their business. Followers should strive to do this too. 7. As a follower you dominate the stream or my wall with a string of multiple posts to draw attention to yourself, as well as to try to sell me something. This is rude…stop it, I know you are there! This is the equivalent of being in a group of people and not letting anyone else speak or air their views too. You are basically saying to everyone “I am more important than you and I really do not care who you are and what you do. Again, if this is the case, why would I want to deal with you in real life? Connections like this are dropped by me every day, as you are in my way and impeding me from developing real connections and real relationships. 8. As a follower your comments and posts are really about nothing. As a connection, you are not educating me or informing me of something that I am interested in, within my chosen field. I am here because I want to learn more about the business of art. If you are not posting something that increases my knowledge of my chosen profession, I do not need to be connected with you. 9. As a follower please do not try to convert me to your world views, politics and religion! I am not on this social media platform to hear this or to be convinced by you as to how I should act, be or how I should think. Remember the old saying that you should never discuss politics, religion or money at the dinner table? The same adage holds true in social media. Don’t do it, as you will offend and lose many people if you do. Keep your personal and business related social media accounts separate. It is now very easy to create separate accounts with Fan and Business pages. 10. As a follower, if I forward a post of yours to a group, repost or retweet one of your posts, “Like” your FB post, Google +1 and share your Linkedin posts, it is polite to somehow acknowledge my efforts on your behalf, but you should also do the same for me sometime as well. Remember: In social media and in life, turnabout is fair play and this type of gesture should be reciprocated by you too. To me, the bottom line is that my time is extremely valuable. In social media, if you are wasting my time, not teaching me something new or alerting me to something of interest within the art field, then you are not a valuable or an interesting connection to me. And if this is the case, let us part ways, as I value how I expend my energy, my mind and my time. If you see yourself in any of these social media behaviors, then with a little effort on your part, over time, you can improve and begin to retain and accumulate more followers, along with becoming a more influential and valued person/entity with social media circles. 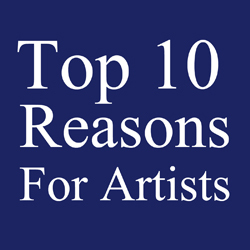 10 Great Ways for Artists to Start 2016!